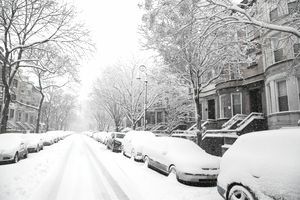 Are you entitled to get paid if your company closes because of snow or if you can't make it into to work because of snow, and what about other inclement weather or natural disasters? There are several factors involved in determining whether you get paid for inclement weather days, including whether you are an exempt employee or a non-exempt employee, federal and state law, and company policy. Another factor includes whether the company is closed, or whether it is open but you cannot make it into work. Read below for detailed information on getting paid for snow and other inclement weather days. The Department of Labor’s Wage and Hour Division oversees the Fair Labor Standards Act, which establishes employment standards such as minimum wage, overtime, and more. According to the Wage and Hour Division, there is a difference between how employers must pay exempt employees and non-exempt employees. There are also state laws that regulate how and when employees are paid. Employers must be in compliance with both federal and state regulations. Non-exempt employees are those that are not exempt from overtime pay. Most non-exempt employees earn an hourly wage rather than a salary and are paid overtime (typically time and a half) for hours worked over 40 hours per week. For non-exempt employees (who are paid on an hourly basis for hours actually worked) federal law does not require them to be paid when they do not come to work due to inclement weather, either due to inability to come to work or because the company is closed. If the company closes partway during the day due to weather, the employer only has to pay non-exempt employees for the hours they worked before the closure. Some states have "reporting time pay" laws that require non-exempt employees be paid for a certain number of hours whenever the employee reports to work as scheduled, even if no work is available. For example, California employers are required to pay half a day's reporting time pay to employees who report to their job but aren’t able to work. Check with your state department of labor for regulations in your state. The Wage and Hour Division publishes opinion letters that provide guidance for employers that are deciding how to pay exempt employees during periods of inclement weather. Exempt employees are those who are exempt from overtime pay requirements. Exempt employees are typically paid a salary and earn a specific minimum salary. The guidance for paying employees who can’t work due to inclement weather varies based on the company’s leave plan, whether the employee has accrued time-off and other factors. The guidelines for paying exempt employees are also different based upon whether the company is closed because of the weather or whether the company is open and the employee opts to stay home. Read below for more information about each scenario. Employers who close during periods of bad weather must pay the weekly salary for an exempt employee during the closure. Thus, regardless of whether an employee was at work for the entire week, the employee should receive his or her salary for the full week. However, an employer may require an exempt employee to use accrued leave for days of absence during such a closure. This accrued leave might include paid time off, vacation time, or other forms of accrued leave. That being said, the employer is still obligated to pay the full salary of the exempt employee, regardless of whether the employee has a leave balance. If the employee has no more leave time left, an employer may be required to advance leave time to him or her. Employers who remain open during such periods must pay an exempt employee for any partial or whole day the employee reports to work during such periods. For example, even if an employer closes the business part way through the day because of weather (perhaps the weather is worsening, for example), he or she still must pay exempt employees their full salary. For days when an exempt employee elects not to report to work because of weather, the employer is free to deduct accrued leave for such absences from the employee's leave bank. If the exempt employee is not yet eligible for accrued leave or has exhausted such leave, an employer may make a deduction from pay for whole-day absences. Check with your human resources department or manager for information on your company’s inclement weather policy and how that policy applies to you. Some employers allow employees to work remotely during bad weather. In this case, they generally receive their full salary and do not have to use any accrued leave time. If you're not sure about company policy, check with your supervisor or human resources to see if that is an option that is available to you. If it is, you should be paid your regular rate of pay for the hours you work from home. How Many Hours a Week Is a Full-Time Job? How Much Vacation Time and Pay Do Employees Get?